Art on the Brain is a unique exhibit on display at Falk Library. The centerpiece of the exhibit is six awe-inspiring works by artist and neuroscientist, Dr. Greg Dunn. The artworks are titled: Self Reflected (illuminated micro etching), Visual Cortex (custom designed), Olfactory Bulb, Synaptogenesis, Basket & Pyramidals, and Retina in Inks. 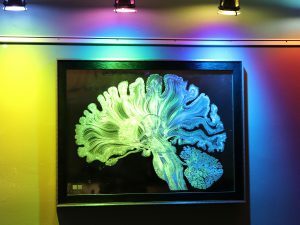 Dunn visits HSLS for the opening reception and lecture titled, “Self Reflected: Deeply Fusing Art and Science to Create the World’s Most Complex Artistic Depiction of the Human Brain,” on April 3 from 2-4 p.m. in Scaife Hall. These works will remain in the library on permanent display after the exhibit. On the library’s upper floor, Dunn’s artwork is accompanied by a creativity relaxation station. Just in time for some finals week relief, visitors are encouraged to build a brainy puzzle, use an app to create digital art, or color your own brain images. Does all of the beautiful art have you feeling inspired? Compete in our coloring contest to win a cool neuro-themed prize! The exhibit also extends to include locally produced images from Pitt’s Center for Biologic Imaging (CBI). CBI’s mosaic posters are prominent in the main floor study area, while journal covers and smaller prints are viewable in the display cases of the main hallway of the library. The final exhibit event will be an introduction to the Brain Image Library (BIL), a partnership of groups from Pitt, Carnegie Mellon University, and the Pittsburgh Supercomputing Center. The Brain Image Library (BIL) is a national public resource enabling researchers to deposit, analyze, mine, share, and interact with large brain image datasets. BIL encompasses the deposition of datasets, the integration of datasets into a searchable web-accessible system, the redistribution of datasets, and a computational enclave to allow researchers to process datasets in-place and share restricted and pre-release datasets. This introductory session will take place on May 29 at Falk Library. The exhibit and associated events are free and open to the public during normal library hours.